The truth about a bungled Pathfinder expedition into what was supposedly Thassilonian ruin has come to light. Instead of being a forgotten ruin from an ancient civilization, the site was actually an ancient and sacred Shoanti mausoleum. 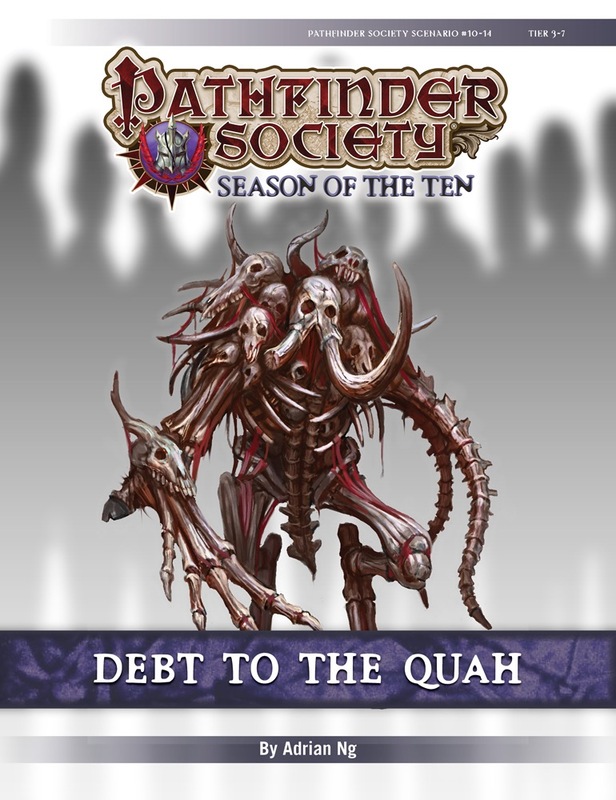 After reading about this finding in the Pathfinder Chronicles, members of one Shoanti quah that has become an ally to the Pathfinder Society has given the Society a chance to explain its actions before a tribal council. If they can secure the council's approval, the PCs will have a chance to set things right at the sacred site. After being left open by the previous expedition, the tomb is filled with both opportunistic bandits and unquiet spirits. Solid adventure with a variety of encounters. Debt to the Quah has an interesting premise where your fellow Pathfinder has done the stereotypical Pathfinder action of raiding a tomb that the local tribes considered sacred. It's a fun deconstruction of the society that every character will probably have a different reaction to. The scenario is split into two parts. The first section requires the PCs to convince a council of Shoanti to let them fix the rogue Pathfinder's mistakes. This uses an abridged version of the influence rules from Ultimate Intrigue (thankfully provided at the end of the scenario). If you played/ran Solistice Scar, then you know what to expect here. The second part of the scenario involves a dungeoncrawl where the PCs have to restore (instead of plunder) a tomb. The scenario's greatest strength lies with variety and quality of encounters. There are social encounters. There are puzzles. There are traps. There is combat with unique monsters possessing rather interesting special abilities. The players particularly enjoyed the last fight despite it becoming a slog for a 4-man party. The scenario also has the best designed haunts I've ever seen in a module. Other authors should take note from this scenario on how to write fun and interesting haunts, instead of haunts that are merely hazards that cannot be interacted with unless you're a cleric or a psychic class. Unfortunately, the scenario is not without its flaws. I encountered the following issues when running this scenario. 1) The four-player adjustment for influencing the council feels incredibly insufficient. A four-player party will only have 20 turns to influence the council. Mainwhile, a five-player party will have the benefit of greater variety of skills while a six-player party will get a total of 24 turns. When I ran this, the party would have lost if not for a lucky string of rolls in the final round. 2) There's a serious typo with the haunt in area A10. The text says that the haunt manifests in the room. However, the haunt's stat block says in multiple places that the effects occur in A8. It seemed weird to me for a haunt in its statblock to specify which room it appeared, so I wasn't entirely sure if it was typo or that the haunt is supposed to manifest in a different room. After rereading the text 5 times while my players patiently waited, I decided to just skip the encounter and say the haunt manifested uselessly in another room. 3) It feels really weird from a story perspective that the party has to destroy the tomb's guardian. The party spends the whole scenario fixing things only to have to break something at the scenario's climax. And if they don't kill the guardian, it counts against their success conditions. It's especially odd given that the party has to clean up a mess caused by the rogue Pathfinder breaking the guardian. Now they have to mess up the room again? I would have expected maybe the party defeating the golem and then restoring it, but by this point in the scenario, most parties will have run out of charges in the scavenger's stone. Otherwise, this is a pretty solid adventure. I actually hope to see more adventures about this rogue Pathfinder. Could this be the Season 10 repeatable!? Although Adrian wrote a fun replayable adventure for Starfinder Society, this scenario is not a repeatable one. This scenario uses just one map—Pathfinder Flip-Mat: Dungeon, also available in the Flip-Mat Classics line. Is this tailored to a specific quah? Is it really going to be available Feb 27? I've seen this before and I have a big group already signed up to play this March 11. Can I trust it'll be out by then? Or should we schedule something else? With a few exceptions—usually based on a scenario needing an unexpected amount of work or an unforeseen major staff outage—scenarios have been on time. This is especially the case since we started the scenario subscriptions, as those require us having products ready a little earlier. So yes, expect this on February 27th. March 11th should plenty of time to prepare and run the game. This scenario involves lots of quahs. I'm not terribly familiar with PFS scenarios, but I'm always on the lookout for things to spruce up an adventure path, whether between chapters or to make overland travel more interesting, and I'm about to kick off the Curse of the Crimson Throne hardcover. The heart of my question is, would this scenario fit thematically/geographically into Chapter 4: a History of Ashes, perhaps as an additional opportunity to supplement that story or even as a background event if the party happens to be in the area while traversing the Cinderlands (with the understanding of course that I would have to scale up the encounters)? With a little tinkering, I think that you could adapt it as a fun side quest. The Sun Clan is not pleased with the PCs overall, particularly given a recent Pathfinder's having sacked a sacred site. The meeting of quahs that takes place in #10-14 serves as an opportunity for the PCs to make their case to the Sun and others. By looking good to many of the quahs, the PCs would have more leverage to get on the Sun Clan's good side. The scenario has a significant typo in one of its encounters. The text for A10 says that a haunt manifests in the room. However, the Forest of Night stat block says multiple times that its effects manifest in A8, which doesn't mention a haunt at all.